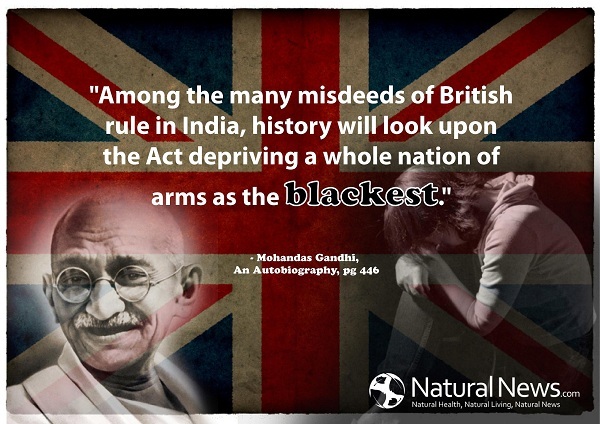 “Among the many misdeeds of British rule in India, history will look upon the Act depriving a whole nation of arms as the blackest.” – Mohandas Gandhi, an Autobiography, page 446. This historical quote was apparently too much for Facebook’s censors to bear. They suspended our account and gave us a “final warning” that one more violation of their so-called “community guidelines” would result in our account being permanently deactivated. That Facebook would choose to disable our account after we posted a Gandhi quote is incredibly shocking. The historical rise of oppressed Indian people against tyrannical British rule is apparently no longer allowed to be discussed on Facebook. The very IDEA of a free people overcoming tyrannical government rule now “violates community guidelines.” The removal of this content is akin to online book burning and the destruction of history. This post was not in any way malicious, nor encouraging violence, nor even describing guns or the Second Amendment. It merely reflected the words of one of our world’s most celebrated rebel leaders who helped an entire nation throw off the shackles of oppression and British occupation. That Facebook would find this to “violate community guidelines” is nothing short of absolutely bewildering. InfoWars.com is also now reporting that Facebook is running an across-the-board PURGE of pro-gun accounts. A huge number of accounts are all being systematically disabled or suspended, with all content being wiped clean. We have entered the era of the Ministry of Truth from George Orwell’s 1984 novel. And while Facebook assaults the First Amendment in America, Senator Feinstein is busy assaulting the Second. What’s especially alarming about all this is that Gandhi himself was of course a champion of resistance against tyranny. To banish quotes from Gandhi is much like banning quotes of freedom from Martin Luther King (who also openly supported concealed firearms, by the way, and who personally owned an entire “arsenal” of firearms). What’s next? Will Facebook ban quotes by Thomas Jefferson and George Washington? Any and all patriots, founding fathers and liberty lovers throughout history might soon be stricken from the Facebook servers, and any who dare to post historical quotes supporting liberty, the Bill of Rights, or the Second Amendment risk having their accounts terminated and all content deleted. Collectivist propaganda has now reached a point where you can’t even discuss liberty or anything out of history that supported the right to keep and bear arms. You are required to stay focused solely on celebrity gossip, sports stars, fashion distractions and tabloid garbage. Anyone who wishes to discuss actual American history must now go underground and speak softly in dimly-lit rooms, behind secret walls and drawn curtains. The era of total oppression and collectivist mind control has fully arrived in America. This is not hyperbole… IT IS HERE NOW. “The tree of liberty must be refreshed from time to time with the blood of patriots and tyrants.” – Thomas Jefferson. Dare to post that on Facebook and you risk your account being disabled or deleted.